I have a weakness for this style of furniture. 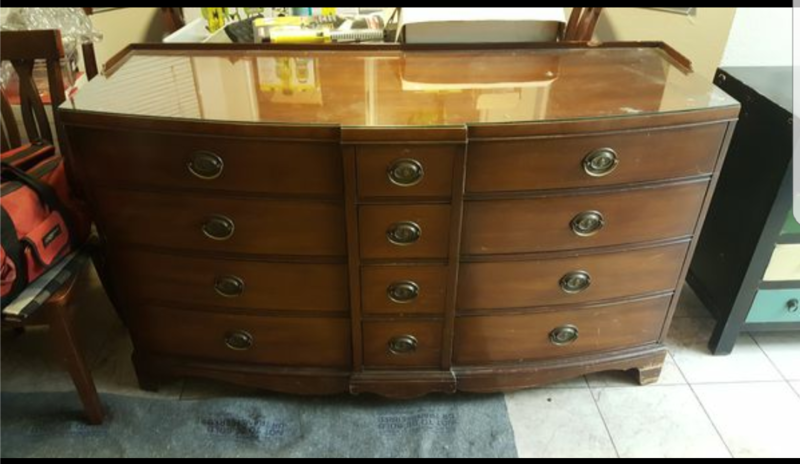 Popular in the 1950’s and 60’s, these solid mahogany pieces get me every time. Classic Hepplewhite pulls, the name Drexel, I pick them up every time, and sometimes over pay. I found this treasure on offer up. They also had a hutch that I wanted but just had no room for. The piece itself was in really good condition. 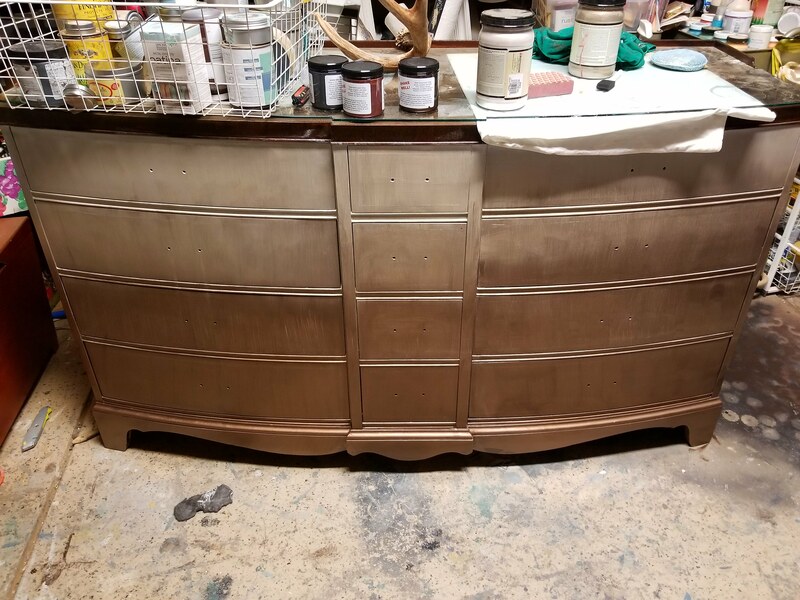 It still needed refinishing from blemishes in the original finish. My initial vision for this piece was as a holiday piece, done in soft metallics, staged in silver and gold, Perfect! Well, if anything, this piece is evidence that the best laid plans don’t always work out as planned…sometimes they work out even better!! I started on this one by cleaning it thoroughly with Dixie Belle White Lightning. You’ll remember from my last post that I hate prep. I cleaned this piece and stripped the top alongside the mermaid blues piece, then set it to the side. 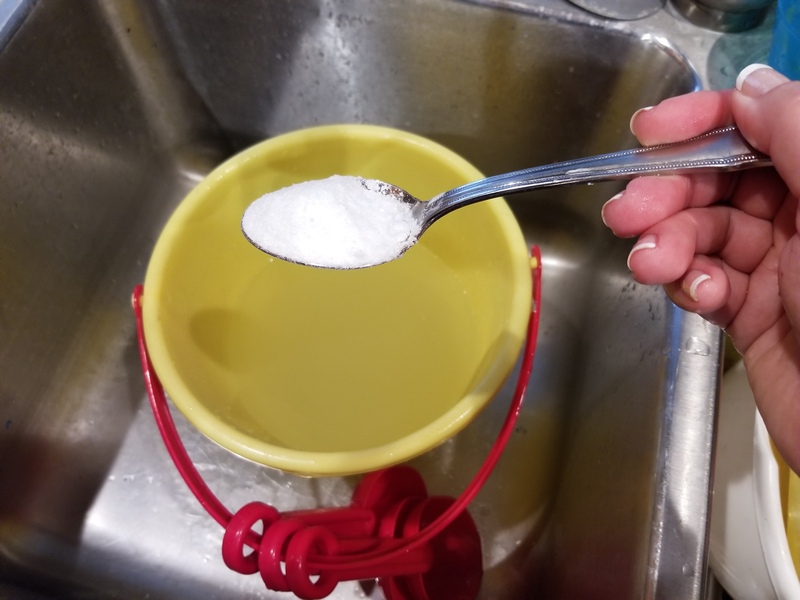 Cleaning is a chance to go over the piece with a fine tooth comb. I found all of the areas that needed a bit of sanding and sanded them out. These mahogany pieces are notorious for bleeding. The tannins in these old, garish, red stained pieces bleeds through chalk paint without fail. 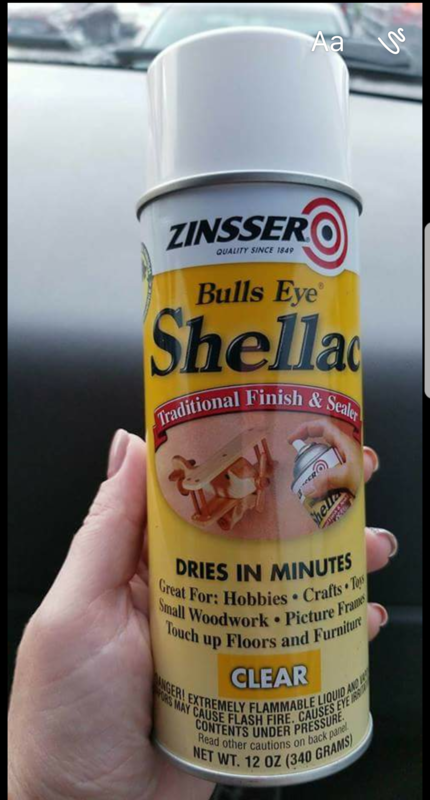 I usually handle bleed by painting a coat, seeing if bleed occurs, if it does I seal with a coat of shellac, then apply my second coat. Two coats are needed anyway so this assures I do not do an extra step. 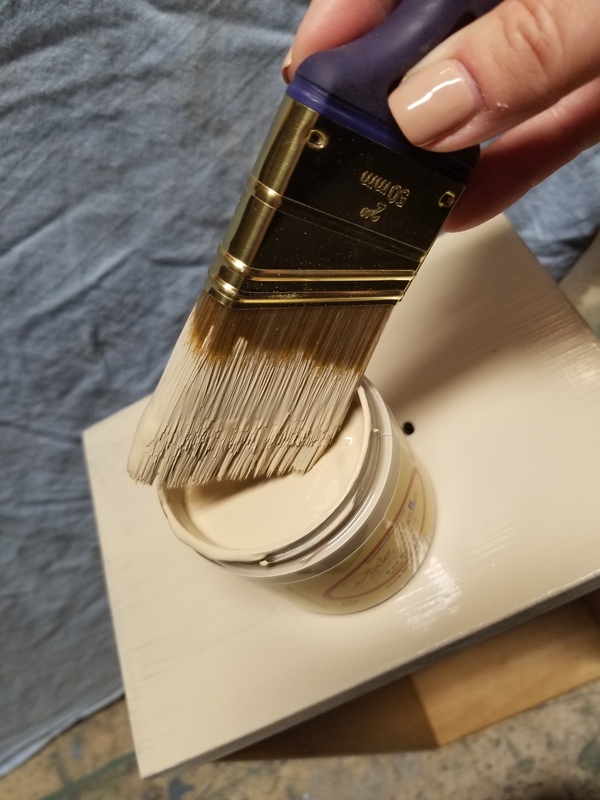 However, on this piece, I anticipated bleed, especially where I’d sanded the old finish back, so I applied a coat of zinsser spray shellac before any paint. 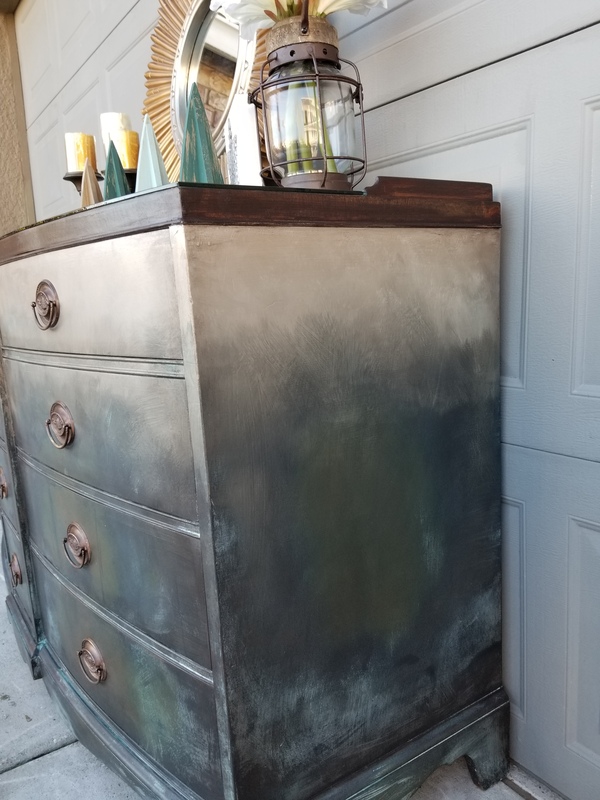 My only experience with patina paint was putting a faux copper finish on a few pieces of hardware, so I didnt really have an idea what to expect on an entire furniture piece. That led to my naivety in what the final look would be. 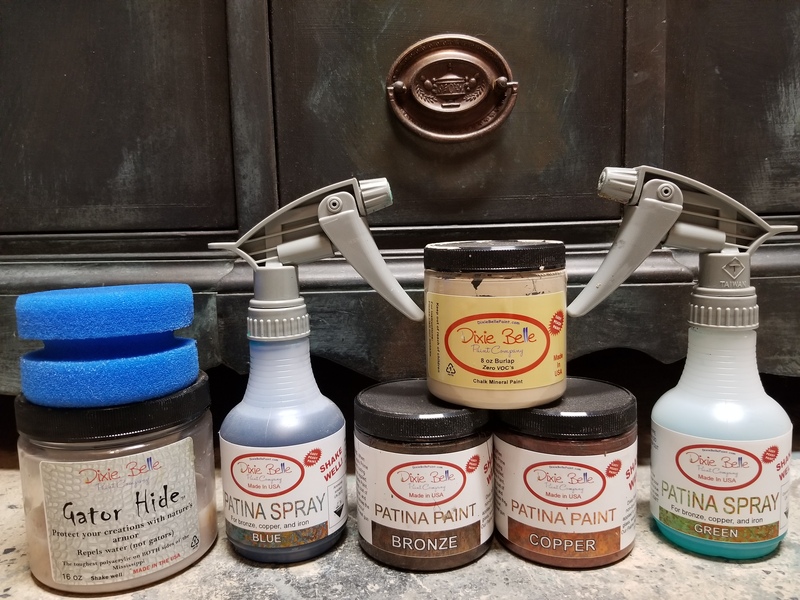 Here are the Dixie Belle paint products I used (along with pearl glaze not pictured) order here through my affiliate link and follow along with this look! Hard to believe this is what it started as! 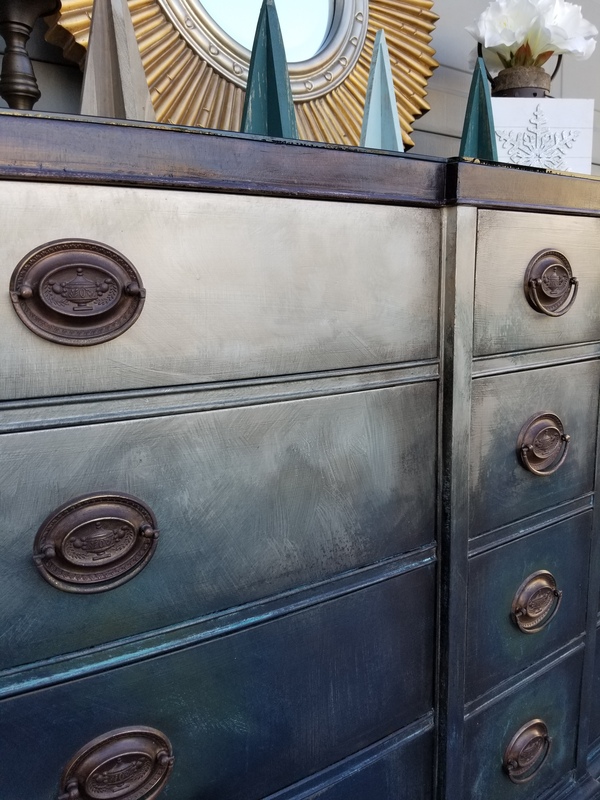 The patina paint says to apply a coat of metallic, let it dry, then apply a second coat and patina spray while that is wet. Here come the metallics! I pictured something imperfect, not a smooth ombre, but a more random transition between the colors. 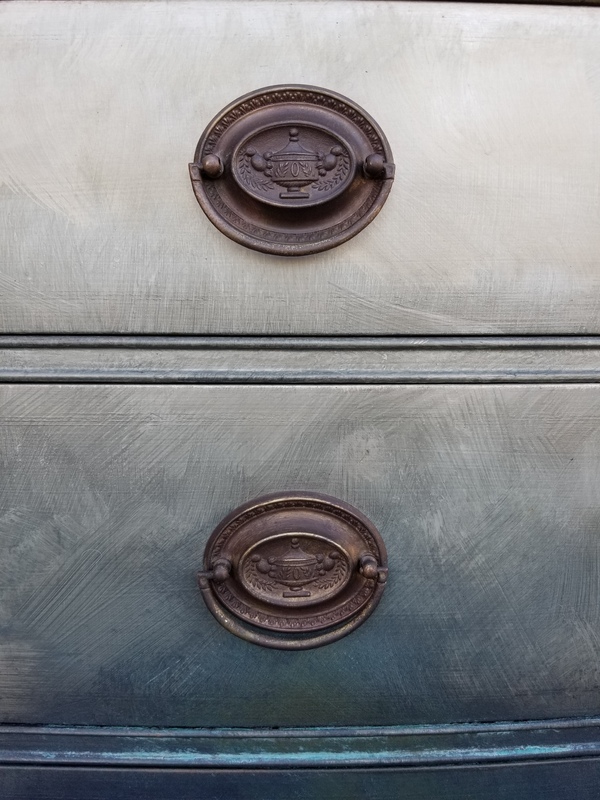 I noticed while applying the patina metallic that random directional brush strokes gave it a brushed metal look. Interesting! I’m going with it! 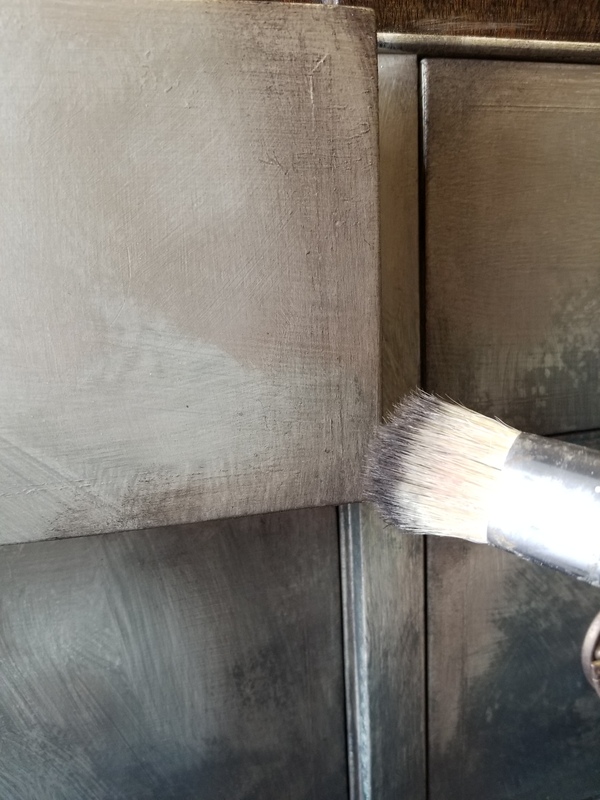 This is literally the step before applying the 2nd coat and patina spray! 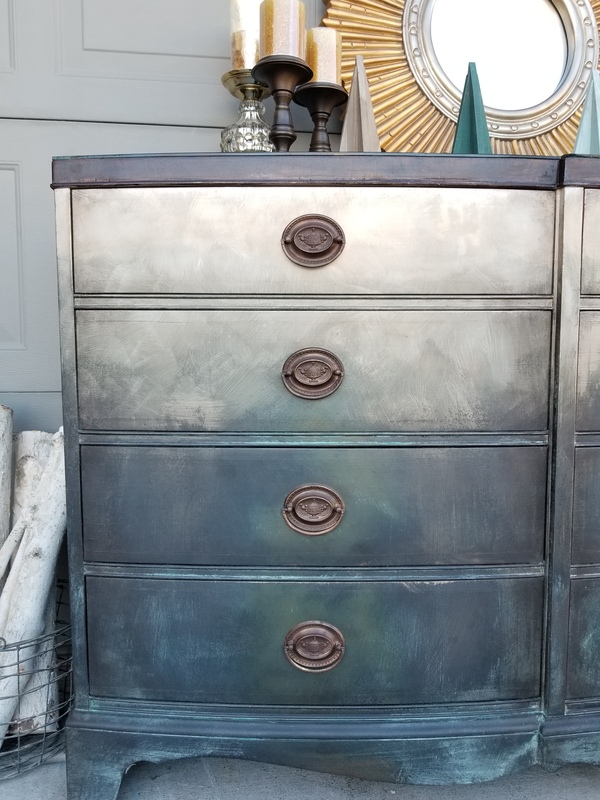 You can see how much the patina spray transforms the color. The paint has actual metal flakes in it, and the color comes from a corrosive process of the metal in the paint, caused by the spray. This glossy bronze is not going to last long! You can see the randomness of the brush strokes, short and random, blending the bronze into the burlap. I’ll try to explain this next step as best as possible, I didn’t do a video here because I had no idea what to expect. Without using the paint, it’s hard to describe what happens. 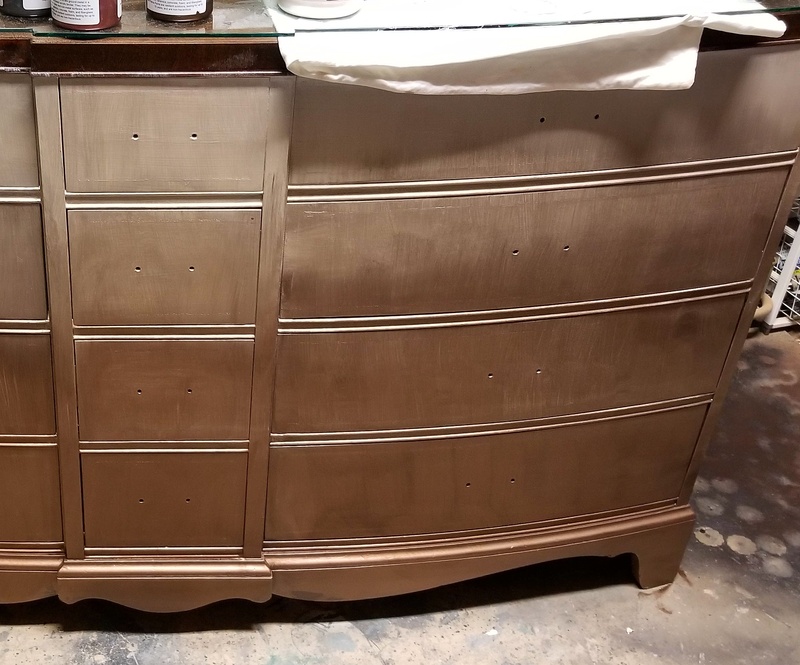 I applied a second coat of the bronze, literally copying the look above, the pearl portion is not a patina paint. I did half of the face at a time and then the sides on their own. 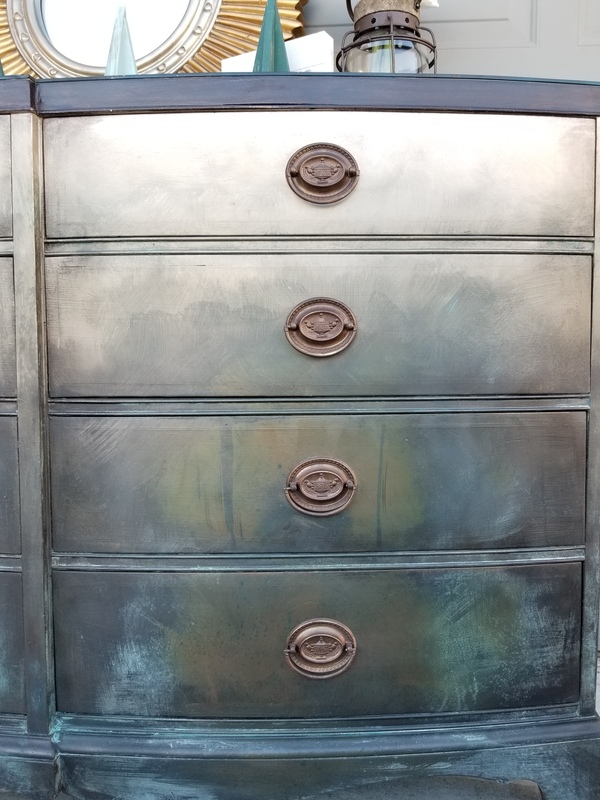 Once I had a coat of bronze, I started with blue patina spray. My first thought was just as an accent along the corners. 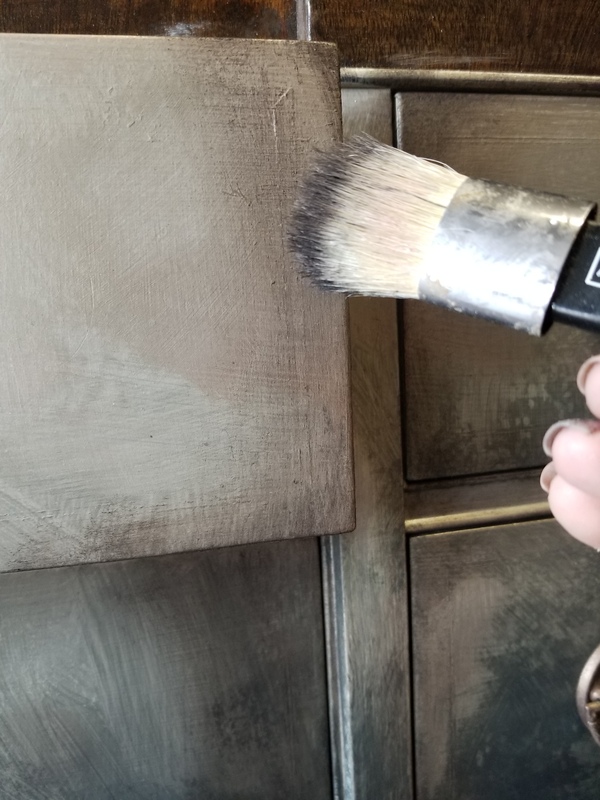 I didn’t want a dripping or runny look so I brushed the spray into the paint using the same short random strokes. 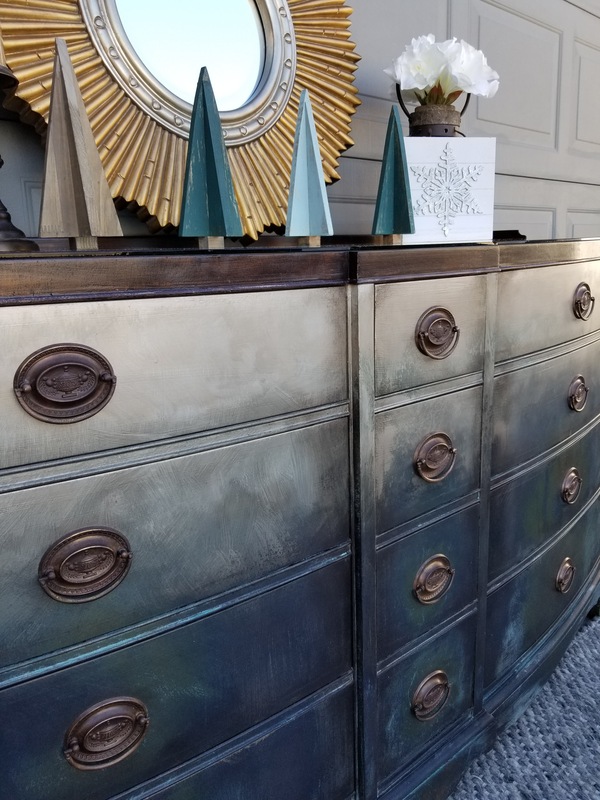 I added a coat of Dixie Belle Paint in burlap to the top and used Dixie Belle pearl glaze to create a metallic for the top. 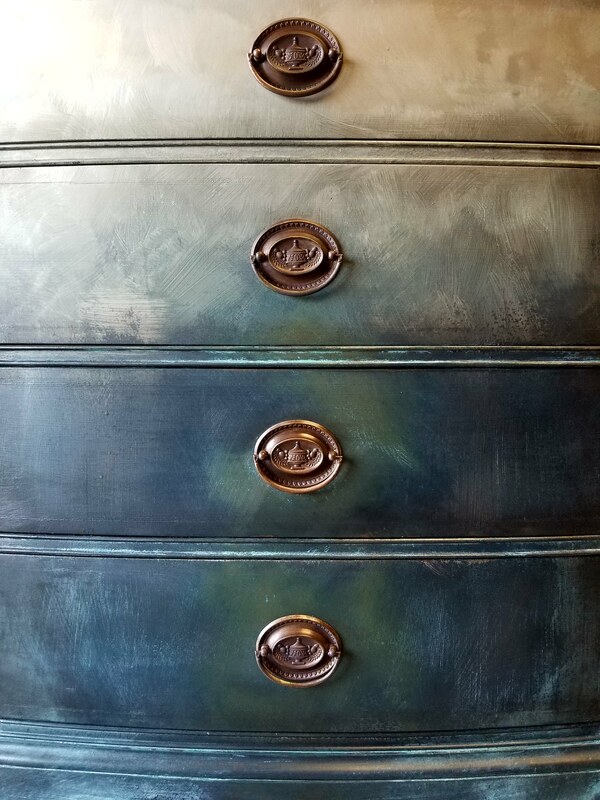 As the two colors met, I brushed the bronze paint, the patina spray and the pearlized burlap together. The patina paint and spray were more sparse up here so it reacted only where the bronze existed. 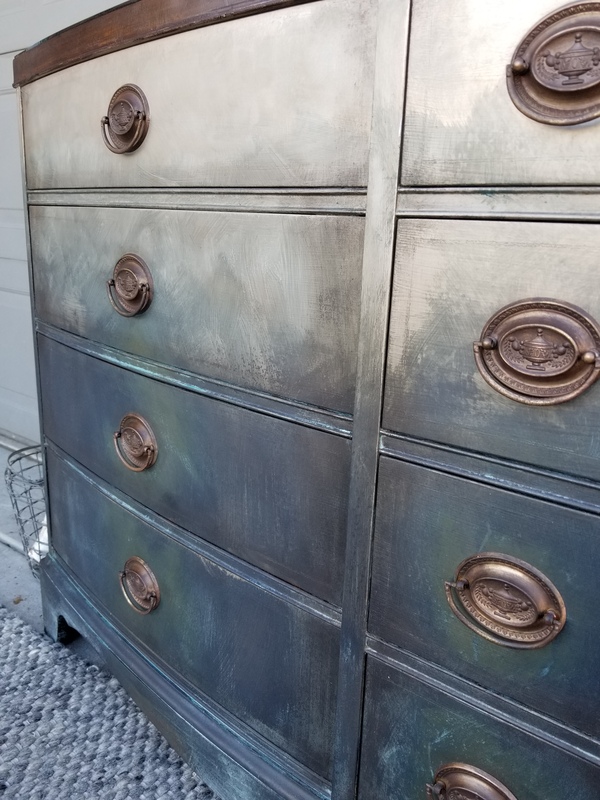 I wanted more variation on the bottom so I added some Dixie Belle patina paint in copper to the drawer centers and green patina spray and brushed that into the bronze/blue areas. That created a slight highlight around the hardware. The key to this look is the randomness of the brushing. It is a messy, almost industrial look. 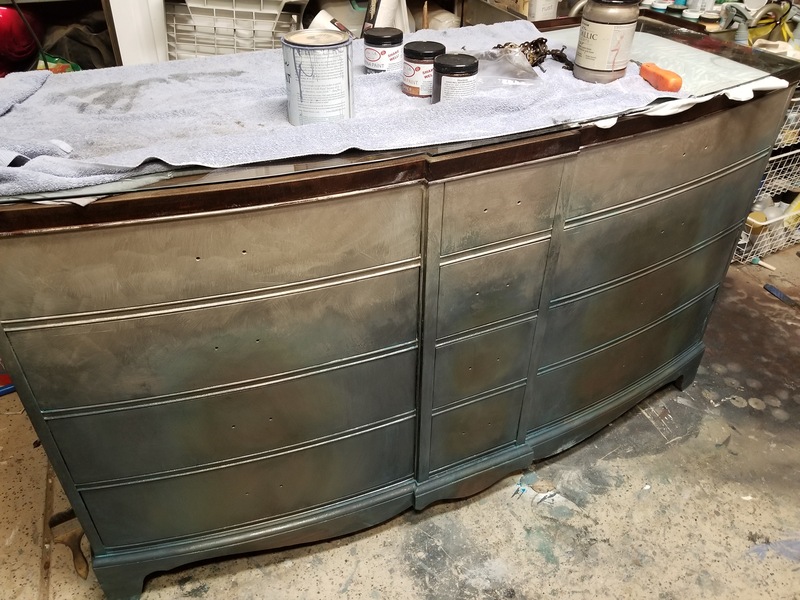 The patina spray was more reactive in some areas and less in others, depending on how I’d brushed, and that was beautiful. The next day there were some spots of heavy turquoise residue from the corrosion process. I wasn’t a fan of those, they brushed away under a coat of wax. Dixie Belle Gator Hide would have been great over this finish, but I’m a wax girl 🙂 I love the soft, smooth texture of a good coat of wax. 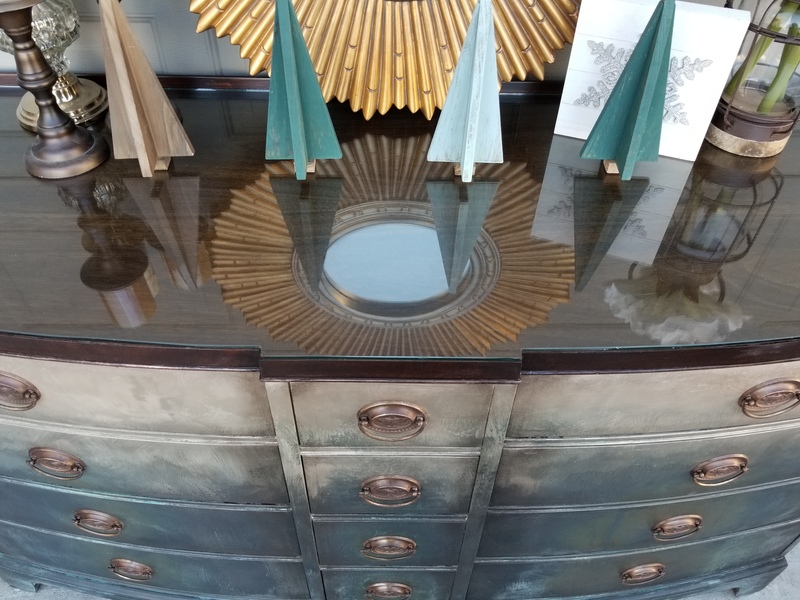 I have waxed pieces in my home that get daily use and it wears great. I applied Dixie Belle Best Dang Wax in clear over the entire body. 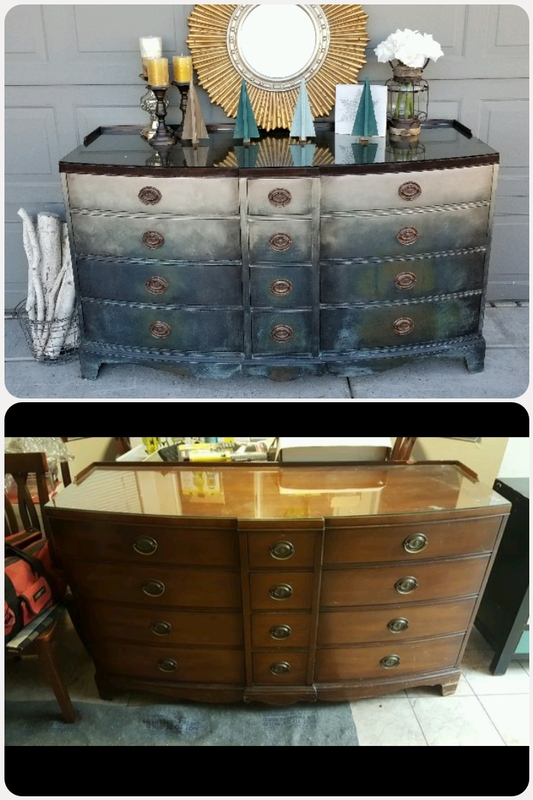 The hardware was soaked in white vinegar overnight and wiped clean, but I did not scrub the old patina off. I left the brass darkened and added a bit of bronze rub n buff to make them more uniform. 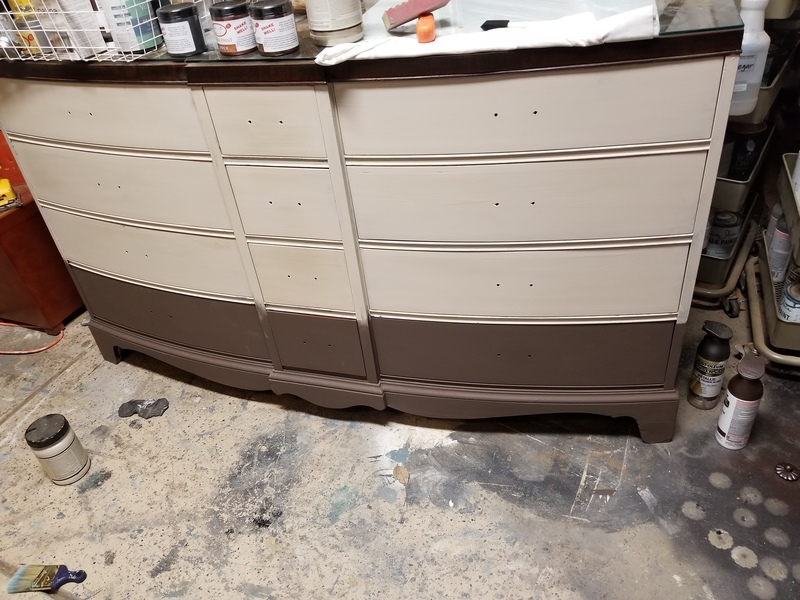 I added just a hint of Dixie Belle Best Dang Wax in brown and black along all of the drawers edges for a bit of extra “grunge”. These up close shots really show the randomness of the paint strokes, how the colors blended, and the spray created it’s own colors. Literally no hint of the strong metallic bronze or copper left. In hindsight, I should have done this step on camera, but hopefully the words and pics show that the patina paint comes alive on its own! Keep it random and unexpected, that is what a genuine, corroded look would be! Here is the final piece! Since this was intended to be my holiday piece, I couldn’t let that go. Now it is a dark, stormy holiday instead. A bundled on the couch with hot cocoa kind of piece, and that says holidays to me! I staged with wooden trees to accent the blues, a gold starburst mirror to show the metallics and a nod to the era of the piece. 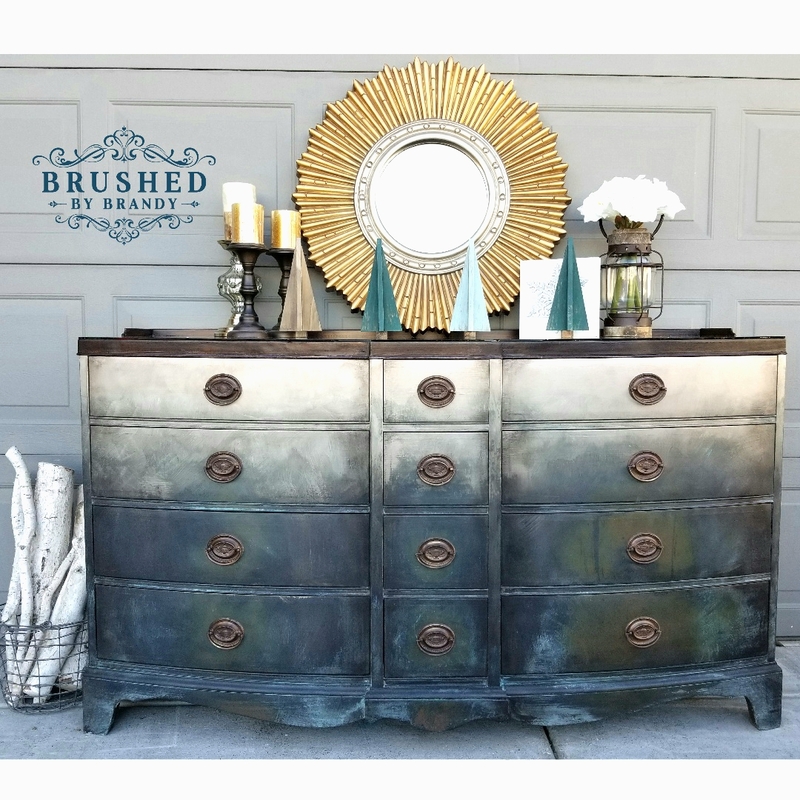 Happy Holidays from Brushed By Brandy! I hope you decide to try, I’d love to see it!! Thank you!! My favorite piece to date as well! Stunning! This is the piece I saw a picture of and inquired how it was done and Dixie Bell posted your info. Now this one you should have kept a secret..like it’s your signature piece and noone can copy it lol. I’ve never seen anything like this. Just gorgeous. No two artists would ever paint it the same! I will do another one like this for my new home, still my favorite! I love it, after reading it sound so complicated for a newbie like myself. Taking a chance.. is this piece for sale? 😭😭no, this one sold rapid fast, but there could always be another if you are interested! I am in the Sacramento, CA area, are you local? Hello, Brandy. I love your work. You are so talented!! I see you did this piece over a year ago. 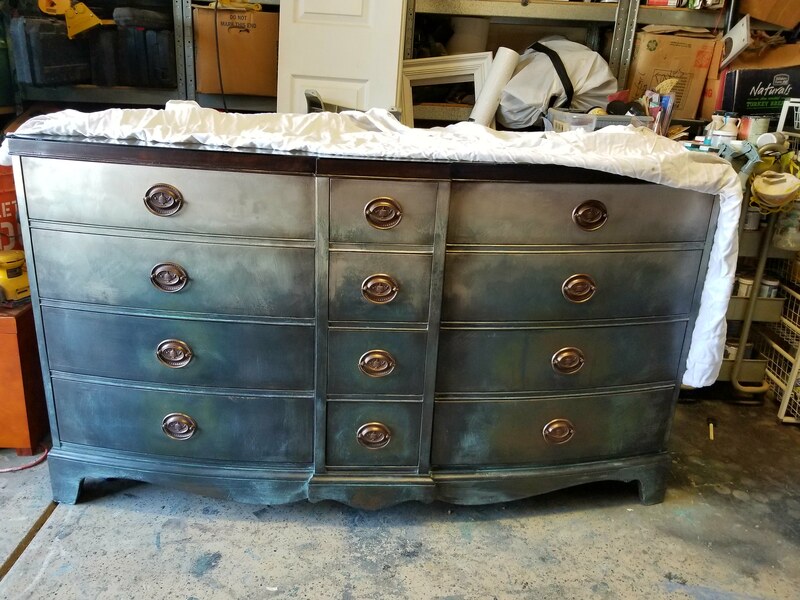 It is so beautiful and I would love to try this on two pieces of my bedroom furniture, but they are big pieces and well, I’m scared since I haven’t worked with patinas and also haven’t yet perfected my ombre technique. I’d like to order these products from you to try, but would you have any tips or other posted videos that I can look at to get a better idea on using the patinas and blending those in? Maybe you can direct me on purchasing first and then message me after.